Grieb & Benzinger Skeletonizes The A. Lange & Söhne "Tourbillon Pour le Mérite"
This is something that came to our attention today and it’s appearance certainly begs the question: What heights can watchmaking reach after perfection is attained? And Is it possible to strive for even more? This one of a kind piece vividly supplies the answers, for what we have here is the rare and highly sought after “Tourbillon Pour le Mérite” by A. Lange & Söhne, a work of art in itself, now transformed into a totally different kind of watch by GRIEB & BENZINGER, the masters of skeletonization. Behold the BLUE MERIT in the picture above and note the lovingly decorated details that this watch is abundant with. Grieb & Benzinger chose to rework the “Tourbillon Pour le Mérite” by A. Lange & Söhne in order to celebrate the 20th Anniversary of the brand coming back after a 50 years hiatus. 20 years ago in 1994, Walter Lange, great grandson of founder Adolph Lange, presented the newly incarnated brand’s first collection to the world, marking the start of a meteoritic rise to the top of the horology. 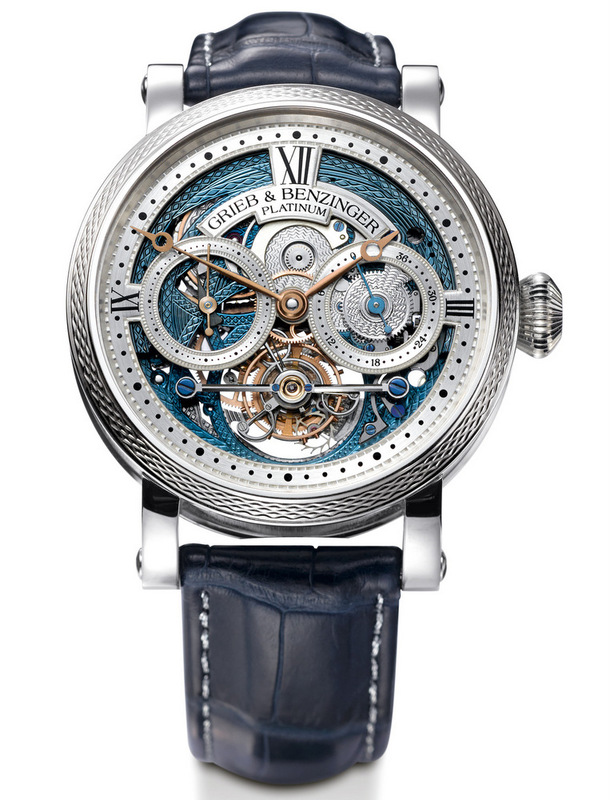 With A. Lange & Söhne being the pride of German watchmaking, it is no surprise that Grieb & Benzinger, a German company as well, would chose the “Tourbillon Pour le Mérite” as the watch for this unique demonstration of watchmaking’s highest decorative arts. This is after-all an exclusive one-off piece that will sell for US$ 530,000/385,000 Euros, making the lucky buyer the owner of a rare horological treasure. The creation of such a watch is not for the faint of heart. Certainly, no one but A. Lange & Söhne themselves should be allowed to ever open the case of one of their watches. 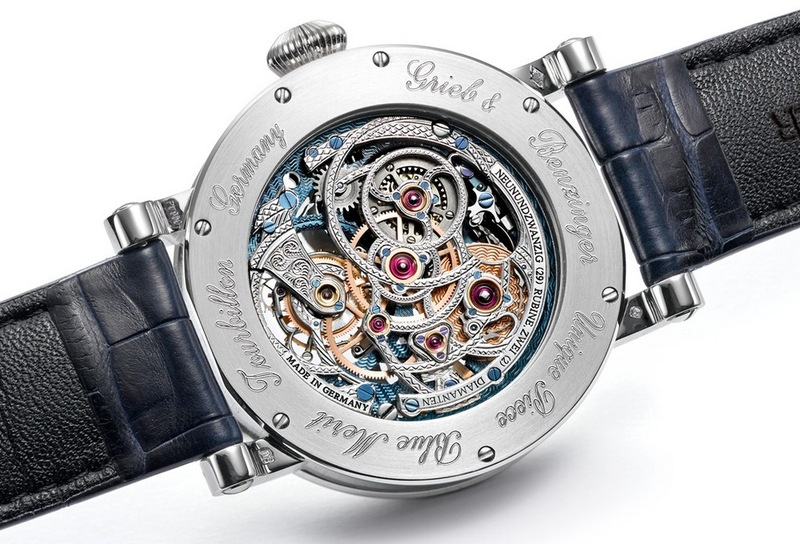 To the credit of Grieb & Benzinger then, they have not only demonstrated their high expertise in its decoration, but also in the minute modifications required to prepare the base plate and bridges to do this, while guaranteeing perfection function of the movement. With the fine guilloché extended to the edges of surfaces, original drillings had to be moved by less than one-twentieth of a millimetre. To this, an additional bridge had to be designed and fabricated, to accommodate the skeleton works and the slight modifications to the movement layout. 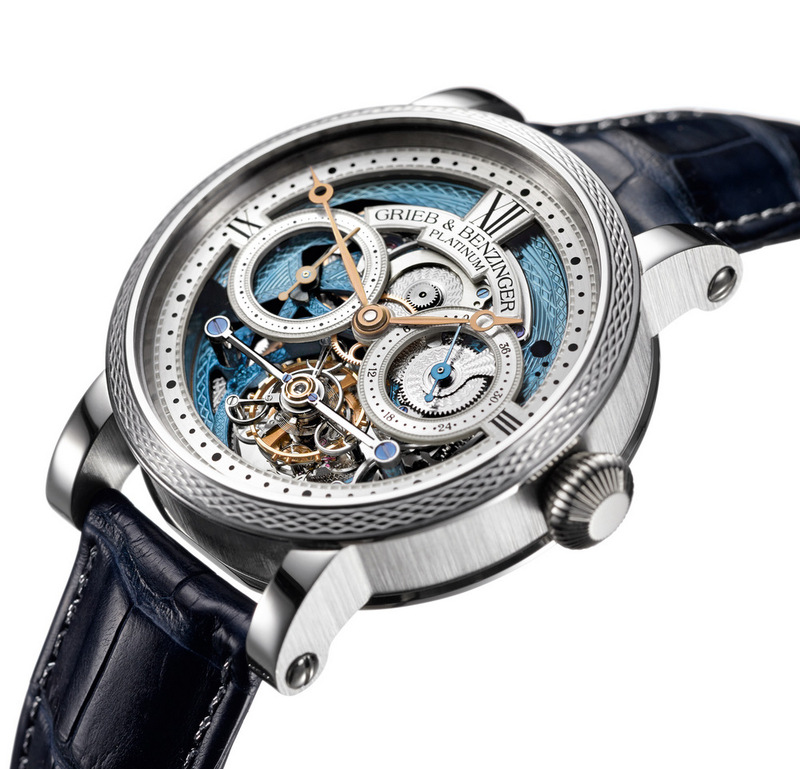 Then all the pieces were coated with rhodium and rose gold, with the base plate receiving a blue coat of platinum, a signature feature in every unique piece by Grieb & Benzinger. Look out for more information on this watch as it comes through, and we’ll see if we can snag a few live pics of the watch for its breathtaking decoration. In the meantime, have a look at Grieb & Benzinger’s website for more information.